Everybody around us is trying to gain maximum benefits out of their business. Whether it is a street side shop or a multinational company, owners leave no stone unturned to raise their profits. The same thing goes with Dropshipping companies. They start and run dropshipping stores to get substantial income. The growing e-commerce industry has left all doors of profits open for Dropshipping companies. The profit that you can get through your Dropshipping stores is basically the difference between the two prices of a particular product: the price that your store shows, and the price already mentioned by the original seller of that product. This simply means that to gain maximum profits, you must specify your price higher. But there are many other strategies which help to bring you the maximum possible profits. Here, we will talk about 8 major tips that you can follow to achieve the same. Focusing on costs is the first and the foremost thing that a Dropshipping store owner should do. Minding your expenses is the starting point of your Dropshipping business. If your profit is less than that of your expenditure, then there is no point in that business. You are simply in the loss. So, you must take care of the difference in the costs of your business. When you are running a Dropshipping store, these are some of the expenses that you need to incur. • The original cost of your product or the price of your product specified by the original seller. • The shipping cost contributes a major part in the expenditure of your business. You must give more importance to the products with the ePacket delivery or free shipping because these are some most appealing and affordable delivery options for both your customers and you. But if your seller charges you for the shipping, the best idea is to include the shipping costs in the price of the final product. • The branding cost is another important aspect of the business expenditure. Preparing a proper branded package of your product is crucial. To add some promotional pamphlets into your product package or to put a sticker of your brand on the packet, or anything like that, you have to pay a bit extra to the seller. This kind of branding adds charm to your business image and reputation. But you should calculate your costs carefully if you chose to do branding of your product. A reasonable price can be very beneficial for your Dropshipping business. We will tell you why. • A meagre price will not let your business stand out from the competition in the market. Customers who are price conscious will look for an even cheaper option, and your business will end up with zero profits because of the ill-suited price. In this way, your company is not targeting this kind of audience, but it is focusing on raising impulse purchases. • A low price will not help you gain the trust of the customers. If a product is cheap, customers tend to look at it with suspicion of being poor quality wise, and you definitely don’t want to create such reputation for your business. • Don’t be humble about a product which looks classy and solid. Set a proper price for your product, the price that it deserves. • You can achieve a right amount of your revenue from a small set of products that is easily manageable. This set of products includes top-selling products of your store. You need to understand that which items are most famous among your target audience, and then you can alter their price and experience the profits they reap. • Most of experienced Dropshippers often experiment with the price. They increase their product cost very often. You must opt the same strategy for your Dropshipping store. • If your products are very exclusive and your business targets a tiny audience, then you must pay extra focus on the strategies of your competitors. But, if you offer more generic products and you have a broad audience to target, then you don’t have to focus on your competitor’s strategies much. Those strategies give you only a basic idea about the market. • You should do an adequate research about the market region, which will help you to recognise the market which holds the maximum potential for your business. For instance, the same handbag with the similar design can have a cost of $20 in the market in the USA and $40 in the Canadian market. You should spread your business in the market which has more opportunities for your business to grow. Who doesn’t like lots of discounts and offers on the products that he or she is buying? The answer is no one. The more discounts and offers you have for your customers, they tend to make more purchases from you. We advise that Dropshippers must set a high bar in the initial stage of pricing strategy of their Dropshipping business. And when their business grows a bit, they can announce a discount or a sale for their products. This will attract more customers to their business, and they will end up having huge profits. You can increase the price of your products as much as you want, until and unless your products meet the expectations of your customers. Satisfying your customers and catering their needs and demands should be your first priority. The first step that you need to do in this regard is to set the target of your audience. Then you must understand the audience that you are targeting. 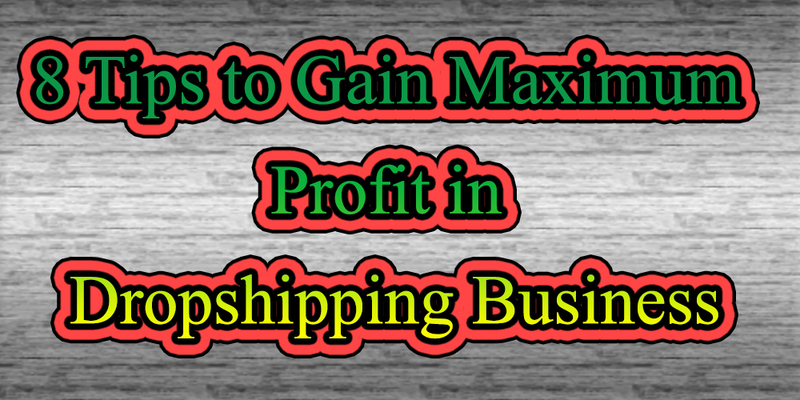 This will help you to plan your Dropshipping strategies to grow your business. You must understand what exactly is attracting your customers to your offers. You must know whether it is the easy availability of your products or their accessibility that is making your customers value them. The rarity and the exclusivity can also affect the number of customers of your store. You must know the factor that is making your Dropshipping store appealing to your audience, and then you can alter the prices of your products accordingly to maximise their sale. This one strategy will help your business to grow at rapid speed. Sellers have been opting many psychological strategies to set the price of their products. There has been a lot of research done in this field, and lots of papers have been written. We will tell you how to apply these tricks easily. • People prefer pricing which ends in an odd number. Yes, you heard it right. The pricing ending with 9 and 7 are preferred more by the customers. They often tend to oversee the part of the price written on the right side, for instance, read $3.99 as $3.00. It’s just pure psychology. • People prefer pricing in round numbers more if they are buying costly items. For instance, they will prefer a $27.00 than $26.97 if your products are from the high-class category. It is unclear why does it happen. Both the strategies might work, or they are just theories. Well, you can try these tricks, they might work for you. Never ever be afraid to do little experiments with your business strategies. Who knows they might land you a fair number of customers. Sounds familiar right? You may have read or heard these taglines somewhere or the other. This strategy is adapted to cause impulse purchases among the customers. When they know that the ongoing offer is about to end, they don’t want to miss the chance to avail that offer. Most of the time they end up doing impulse shopping. So, if you opt this trick, your customers will end up doing the same thing. You can read all the guides on the Dropshipping business, but if you are afraid to make a move to grow it, then there is no use of learning all the stuff. You need to act to grow your business. Don’t be afraid to make the first step. Alter the offers, review the total prices, set new discounts on the products, focus on your business stats and think about the new ways to do things differently and better. Who knows your company can be the next big thing in the Dropshipping market. Why and How we should use Stripe Instead of Shopify Payments ?